In a Loxone Smart Home, the precise measuring of localised weather and the forecasting of weather conditions can play an important role. 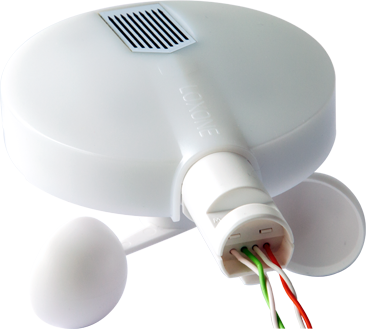 To offer maximum functionality, the Weather Station is coupled with a 10-year subscription to the Loxone Weather Service. To be able to protect your smart home from the elements, it is crucial that your home has access to information about the weather right outside your own front door. To realise this, the Weather Station records wind, rain, brightness and temperature at your exact location. 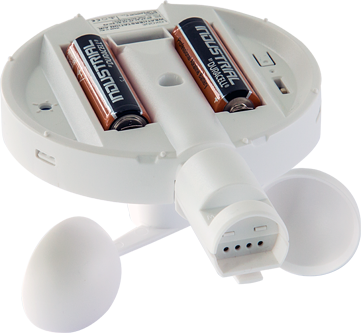 Combining the Weather Station as well as the Weather Service means your home will have access to a detailed forecast as well as real-time localised weather conditions. This wealth of information means your smart home can alert you and make intelligent decisions when it matters most. Risk of another heatwave? Your smart home reliably protects rooms in your home from overheating by automatically lowering your blinds. This can help protect furniture and prevent the temperature from increasing drastically. Your home can adjust the blinds according to the course of the sun and the windows that are facing that direction. A storm is brewing but you aren’t home and you’ve left the awning open from your sundowners the night before… Let your home take care of retracting the awning for you. Thanks to the up to date localised wind measurements, your smart home knows what to do. In a Loxone Smart Home, your garden irrigation is based on the predicted weather forecast as well as the localised weather conditions. This way, your garden won’t resemble an arid desert or muddy marshland from not enough or too much sprinkler action. Let your home take care of your irrigation woes – saving water and freeing up your time. You’re sitting comfortably in your living room and it starts to rain, the skylights that you opened earlier are currently out of sight and out of mind. Normally that would be an issue, but with your Loxone Smart Home, you will be alerted to the open skylights immediately when it starts to drizzle, thanks to the sensor on the Weather Station. If your skylights are motorised then have your home take care of closing them too. Take it a step further with this powerful weather duo… How about having the colour lighting in the hallway turn to blue in the morning if rain is forecast. That way you’ll know to bring in the washing from the line before you head off to work, take your raincoat or close that window. You could also have the lights show orange if it’s going to be a particularly sunny day so you remember to put some drinks in the fridge for a cheeky sundowner on the patio when you get home from work. 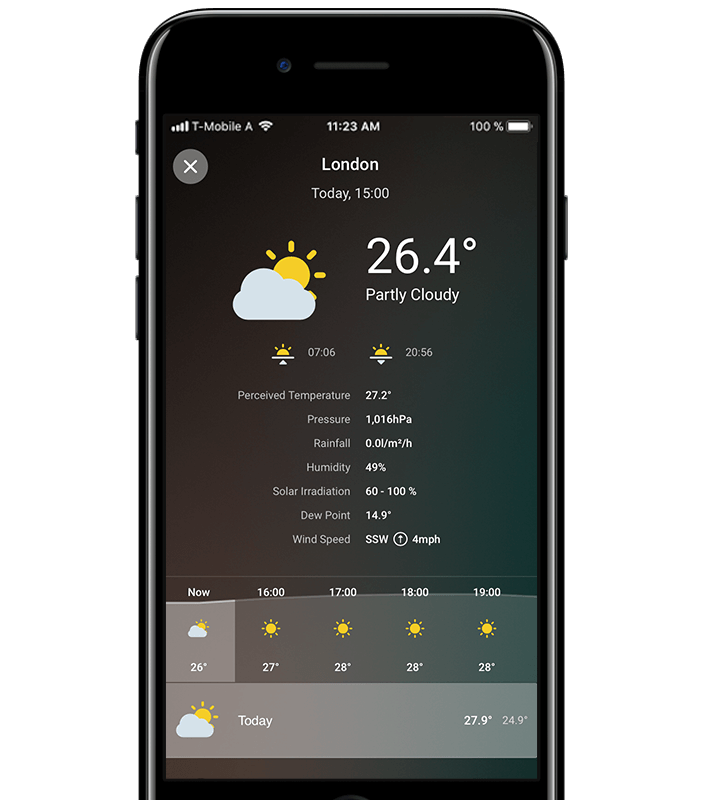 The full weather forecast from the Loxone Weather Service in displayed the Loxone Smart Home App. 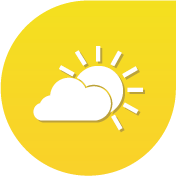 At any time of the day or night you can access information on the predicted weather conditions for the next 66 hours. Designed specifically for those who want to enjoy the benefits of intelligent smart home automation within their existing home, we’ve developed our own wireless technology: Loxone Air. It is the ideal smart home solution for retrofitters and renovators alike. Devices boasting Tree technology are considerably easier to integrate into a Loxone Smart Home – working seamlessly with one another to deliver feature-rich home automation. Thanks to a free-form cabling topology, installing Loxone Tree devices potentially saves time and cable compared to a tradition install. The Weather Station is not suitable for installation in coastal areas as this causes corrosion of the rain sensor.